Eight Ukrainian people's deputies will be investigated in the case in the case of the flight of the detained Mikheil Saakashvili from custody. 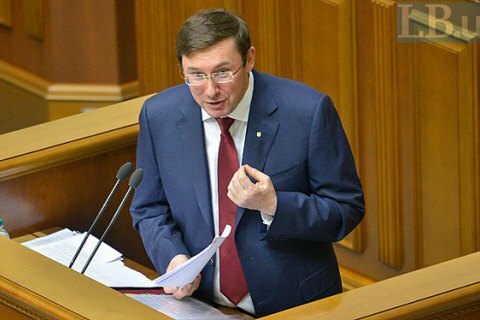 Prosecutor-General Yuriy Lutsenko whaen speaking in the Verkhovna Rada on Tuesday said that the prosecutor's office opened criminal proceedings to investigate the actions of the activists who obstructed the legitimate detention of Saakashvili. Lutsenko named the acting people's deputies Ihor Lutsenko, Yuriy Derevyanko, Svitlana Zalishchuk, Mustafa Nayem, Oleh Petrenko, Yuriy Levchenko, Serhiy Leshchenko, and Viktor Chumak. He underscored that these lawmakers will not be served the notices of suspicion yet but "will be certainly questioned in due time". The chief prosecutor called the actions of MPs supporting Saakashvili "shameful" and paid for by oligarchs. He reminded of Saakashvili's violent breakthrough across Ukrainian border that was accompanied by the beating of law enforcement officers and border guards. Lutsenko also admitted that he has miscalculated about the scale of Saakashvili's support. "We thought that an individual exposed of Moscow connections cannot count on the support of ordinary people, let alone people's deputies. However, the hunger for power and personal gain blinds the eyes of those who, contrary to the obvious ties between Saakashvili and Moscow, persist in their subversive activities," Lutsenko said. The great Ukrainian poet [Taras Shevchenko] called such people "footsteps, the dirt of Moscow."